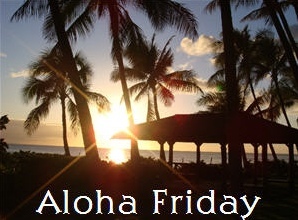 Life Music Laughter: Aloha Friday, Do You Watch XFactor? Do you watch competition shows? Are you watching XFactor? I have watched several episodes of The X Factor and enjoy it. I didn't get to see the latest episode so I missed the temper tantrum. That's a shame for him to act like that. No. I don't watch much TV at all. I had the tv on and overheard his temper tantrum. (I didn't watch the entire episode) I felt bad that the other girl was kicked off after that. He shouldn't have been rewarded for bad behavior. The X Factor should include some grace and humbleness, in my opinion. I watched one of the earlier episodes, but haven't seen any since. I mostly watch cooking or design competition shows.